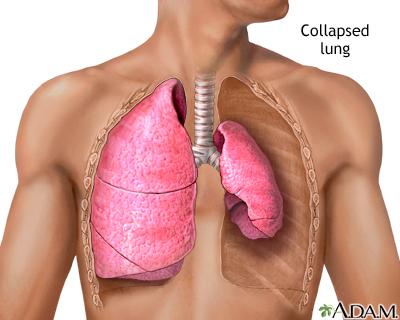 A collapsed lung, or pneumothorax, occurs when all or part of a lung collapses or caves inward. This occurs when air gets in the area between the lung and chest wall. When this happens the lung cannot fill up with air, breathing becomes hard, and the body gets less oxygen. A collapsed lung can occur spontaneously in a healthy person or in someone who has lungs compromised by trauma, asthma, bronchitis, or emphysema. Updated by: Jacob L. Heller, MD, MHA, Emergency Medicine, Virginia Mason Medical Center, Seattle, WA. Also reviewed by David Zieve, MD, MHA, Medical Director, Brenda Conaway, Editorial Director, and the A.D.A.M. Editorial team.